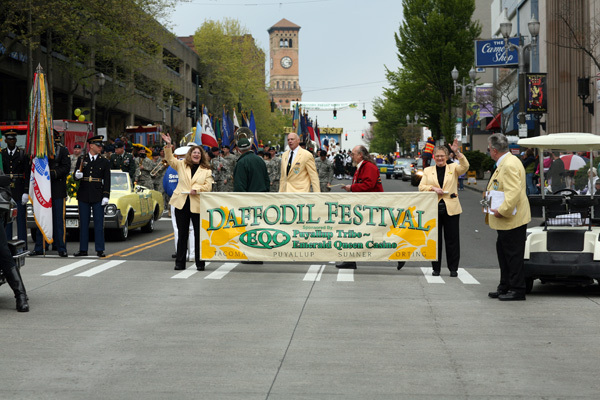 Above are links to the galleries of photographs I took at the 2007 Daffodil Festival in downtown Tacoma, Washington. The first gallery is of people in the parade before it starts. The second gallery is of people watching the parade. And the third gallery is of different floats, support and other things in or with the parade. Some words of explanation about the galleries and my photography. I like to shoot the staging area of parades. I go about 2 hours before and just walk around. It's fairly free and open, and safe - just watch for officials and police directing things and people, and people are either busy, relaxing, playing or waiting. It's a good time to see people working, waiting, relaxing, practicing or playing before it starts, and it's a good time to talk to people and get them to pose for you.